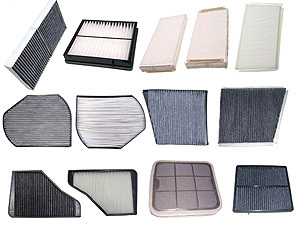 The cabin air filter in cars and trucks are typically a pleated-paper filter that is placed in the outside-air intake for the vehicle's passenger compartment. These filters are typically rectangular. Some filters are uniquely shaped to fit the available space of particular vehicles' outside-air intakes. Being a relatively recent addition to automobile equipment, this filter is often overlooked, and can greatly reduce the effectiveness of the vehicle's air conditioning performance. Clogged or dirty cabin air filters can significantly reduce airflow from the cabin vents, as well as introduce allergens into the cabin air stream. The vehicle's engine uses an air filter to make sure that the air going inside it is free of contaminants. You and your passengers need clean air while inside your vehicle. Use only a quality cabin air filter make sure that the air coming out of the air conditioning system is free of harmful contaminants. Replacing cabin air filter will help keep particles like pollen, dust, and exhaust gases out of your interior cabin. These filters can be clogged by dirt and debris over time which reduces it's filtration efficiency. Regular maintenance can be done by occasionally vacuuming it in between replacements, or between cleanings for reusable filters. However, if it's already extensively damaged or heavily clogged, it's best to replace it at once to ensure the quality of the air coming in. The expert mechanics at Larry's Auto Center can replace your cabin air filter. Just ask us to check it out and we'll let you know if it should be replaced.